As a member of both the '80's premier guitar band RACER X and later, million sellers MR. BIG, Gilbert has gained reputation as being one of the most melodic, but powerful guitar players in the rock arena. Determined not to be pigeon-holed as just a "shredder", Gilbert's solo work has allowed him the opportunity to exercise his deep appreciation for the more song oriented side of rock music. Paul has been releasing many successful solo albums over the past few years which have confirmed his position as one of the premier rock guitar players in the World. “Space Ship One” is his latest offering and this album contains some of the best material Paul has recorded to date. Very strong song structures, catchy melodies and blistering guitars. 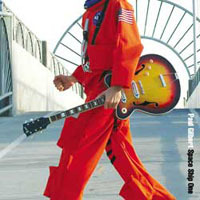 Not only will Paul be releasing his new album “Space Ship One” in 2005, he will also be doing his World tour and will finally come to Europe for concerts.